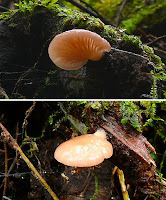 I'm assuming this is a Mycena, but I'm unclear which one. 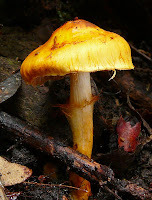 I'm fairly sure this is Pleurotopsis longinqua, previously known as Panella longinquus. Its illustrated in Fuhrer and Robinson (1992) on p. 54, which really resembles this one I photographed. It's also in Fuhrer (2005) on p. 159. Thanks to Denis for finding this one. I need a good close-up lens to get these small ones captured better. Or maybe a whole new camera...I mean, can a bloke have too many cameras? I've often made a half our walk last 4 hours :-) You found some great specimens! 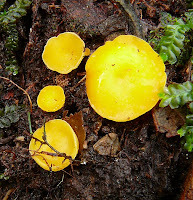 Love the bright yellow "Coral Fungi", in second posting. 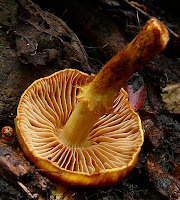 The "ping-pong paddle" shaped ones look like Pleurotopsis sp. Fuhrer P.159. Nice other fungi too. But I don't know what they are. Fungi drive me to distraction. Tassie is famous for its fungi, esp in the Myrtle Forests, it seems.